Galerie Ursula Lichter, Frankfurt am Main, where acquired by the present owner in 1969. E.F. Frey, 'Gerhard Richter. German Illusionist', in: 'Art in America', Nov./Dec. 1969 (illustrated, p.126). 'Gerhard Richter', Venice 1972 (illustrated, p.70). R. Wedewer, 'Zum Landschaftstypus Gerhard Richters', in: 'Pantheon', no.1, 1975 (illustrated, p.48). J. Harten (ed. ), 'Gerhard Richter. Bilder Paintings 1962-1985', Cologne 1986, no. 201 (illustrated in colour, p.86). 'Gerhard Richter. Werkübersicht/Catalogue raisonné 1962-1993', Ostfildern-Ruit 1993, no. 201 (illustrated in colour, unpaged). 'Gerhard Richter, internationally renowned as a painter, has always had a particular interest in landscape-no other motif has fascinated him to the same extent nor has occupied him over such a long period. As many of Richter's works Corsica is the result of a mechanical process of a painted reproduction of a photograph. It is the third one of a serie of several photo-realistic paintings executed from the artist snapshots of Corsica during his first holiday ever. In this works Richter's former black and white photo-paintings start to bear a colourful impact announcing the bold polychromy of his 80's landscapes and his future abstract works. In its will to convey the objective truth of reality photography appears for Richter as an ideal reference: 'the photography is the most perfect picture. It does not change; it is absolute, and therefore autonomous, unconditional, devoid of style. Both in its way of informing, and in what it informs of it is my source' (D. Elger, 'Gerhard Richter Landscapes', Cantz, p. 1). 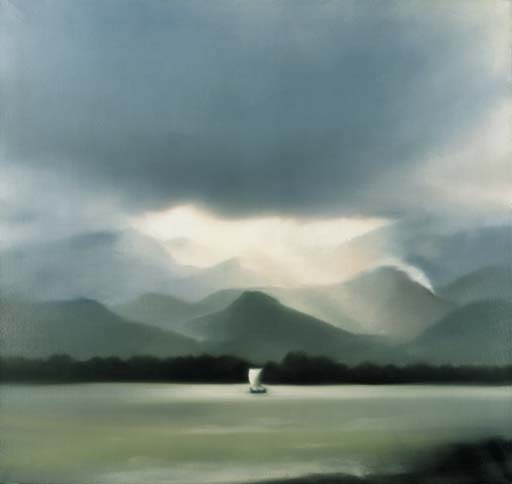 In 'Korsica' Richter uses the Romantic appeal of the photograph of an isolated boat in the middle of the sea under a tormented sky to express the beauty of the seascape's light and colours. Detached from its context and signification the picture does not mean to illustrate reality as we see it but rather conveys through the painting medium an abstraction of reality.